Amnesty International has already collected over 65 000 signatures from all over the world through offline petitions and partner websites in under 2 months. They would like to reach 80,000 by the time residents of Nairobi slums hand over the petition to cabinet secretary Ngilu on 21 November 2013 in Nairobi. On 10 May 2013, nearly 400 homes were destroyed in a forced eviction carried out at City Carton informal settlement in Nairobi, after the settlement was cordoned off by 170 police officers between 4 and 5am. - Account of the forced eviction at City Carton, recorded by Amnesty International researcher, in Nairobi Kenya. No one should be forcibly evicted, no matter where they live. 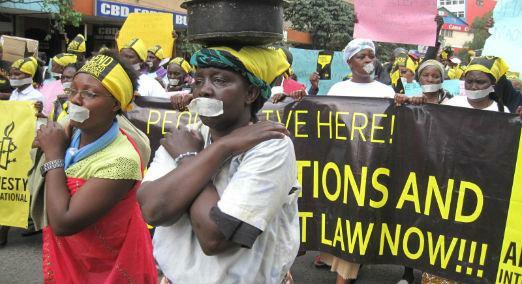 Forced evictions are illegal under international and regional human rights law. People living in informal settlements have the same rights to adequate housing, water, sanitation, education and health care as all others do. To date, the Kenyan authorities have failed to plan for over 50% of Nairobi’s population. Approximately two million of the city’s residents are estimated to be living in slums and informal settlements with inadequate or no access to housing, water, schools, health care and security. As with informal settlements in Mombasa and Kisumu, these residents pay taxes, vote, contribute to the economy and society just like other urban residents, but they are excluded from city budgets and plans.